Hydro, A.S., Oslo, Norway; J.E. All Built As Very Large Mod- ules by Dr. J. Bakke and P.G. Partners Inc., New York (ad- mission by invitation only). Thursday, October 22 9:00 am—Session 4: Transporta- tion Technology and Opera- tions. Chairmen: R.C. Ffooks, consultant, London, and R.J. Tank System of 125,000 cu. m.
MRV Type LNG Carrier (Loads and Stress Analysis) by Dr. R.
IMCO Gas Carrier Code to Pres- sure Type Cargo Tanks by M.
Loads in LNG Ships by Dr. J.C.
Hartzell has been a leading manufacturer of high quality air moving equipment for well over 50 years. And now we're out to conquer the seas with a full line of fans designed specifically for shipboard ventilation. 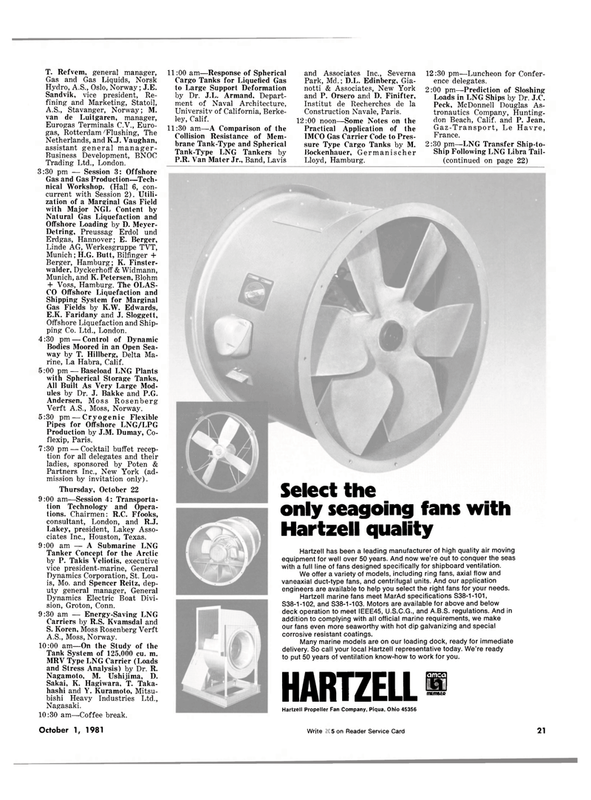 We offer a variety of models, including ring fans, axial flow and vaneaxial duct-type fans, and centrifugal units. And our application engineers are available to help you select the right fans for your needs. S38-1-102, and S38-1-103. Motors are available for above and below deck operation to meet IEEE45, U.S.C.G., and A.B.S. regulations. And in addition to complying with all official marine requirements, we make our fans even more seaworthy with hot dip galvanizing and special corrosive resistant coatings. Many marine models are on our loading dock, ready for immediate delivery. So call your local Hartzell representative today. We're ready to put 50 years of ventilation know-how to work for you.